Globber – The story behind our best-selling KIDS’ scooters! We are often asked “which scooter is best for my child?” and “I’ve seen this product in a different name, is it the same?”, so we want to explain the story behind our brand names to explain how they’ve evolved over the years and how the name can help you choose your scooter! Our idea was simple. How can parents get more usage out of a kid’s product without breaking the bank? The result? EVO scooter with seat was created! It’s all about evolution. EVO scooters with seat adapt as your child grows. Start off in pushchair mode, move up to walking bike mode, then finish with a 3-wheel scooter!! Our EVO scooters can be used by children as young as 15 months up to 9+. When you see an EVO scooter; think evolution! One of the reasons why Globber was established almost 5 years ago was because we wanted to make scooters accessible to all. We wanted to challenge the status quo of having to pay big bucks for a great riding experience; PRIMO (meaning “first” in Italian) series was our solution! PRIMO series 3-wheel scooters for kids come packed with our innovative features to better help your child quickly and safely learn how to scooter. Benefit from our adjustable T-bar, extra-low deck, and our patented steering lock button to help your child learn balance and lean-to-steer riding for children 3+. When you see a PRIMO scooter; think perfect first 3-wheel scooter experience! We went one step further with ELITE to deliver, as the name suggests, the best 3-wheel scooter for kids on the market. ELITE 3-wheel scooters for boys and girls come with our patented folding system to easily fold and store the scooter after playtime. Our ELITE folding scooters for kids also come with a wider deck and rear brake for an even more comfortable ride for kids aged 3+ to 9+! 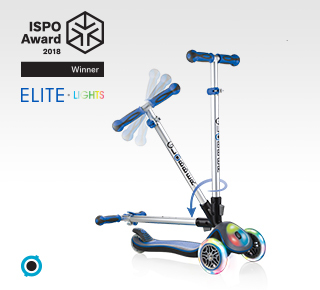 When you see an ELITE scooter; think best foldable kid’s scooter in the market! Even though our products names have evolved & changed along the years, you’ll still be able to find common specifications on our Globber scooters. Want to learn more about our adults’ range? Find out more below! Globber – The story behind our best-selling ADULT scooters!